I first joined Hospital Radio Hillingdon in 2012. I am no stranger to hospital radio broadcasting. My first job after leaving school in 1988 was for a hospital radio station in central London. I was a volunteer there for 13 years. Sadly that station is no longer broadcasting now. At that time I also presented the weekend breakfast programme for a community FM radio station in east London. After a break from radio of about ten-years, I decided to return to a past-time I really love and enjoy doing. I searched the web and Hospital Radio Hillingdon stood out as a friendly and fun station to be a part of. I am so glad I am involved with Radio Hillingdon. It really is a groovy radio station. Everyone here is so welcoming. I think it is fantastic that a service like this exists. Quality community radio for the Hillingdon Hospital. I present two programmes here on Hospital Radio Hillingdon. Get your weekend off to a great start with the "Radio Hillingdon, brightest sound around, weekend starts here, Friday tea-time, more music extravaganza show! ", Friday evening 5-7pm. I hand pick the best music I can find. I will play some tunes you know and some tunes you don't. Music from all through the decades and different genres. Classic hits and rare album tracks. I have an "archive album" feature where I dig around the vast Radio Hillingdon music library and dust off a classic album that has not been played in a while. What is your favourite LP/CD? Let me know and I'll feature it on the show. Music to get your weekend started in style. Also, I try to look on the brighter side of life and talk about the quirky things that have been going on in the past seven days. I'll have some recommendations on what to do over the coming weekend. I'll do my best to get your weekend started with a giggle. I would love it if you got involved by text, telephone or e-mail. I also present the Tuesday night request show with Mary Penley 8.30-10pm (repeated Wednesday at 1pm). I really enjoy playing your music. Its your show. The variety of music is great and we have some good fun. If you have any ideas for the show or any requests you would like me to play then just get in touch. 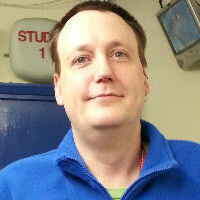 It would be great to hear from you simon.tombling@radiohillingdon.org.uk or *800 from your bed-side phone.